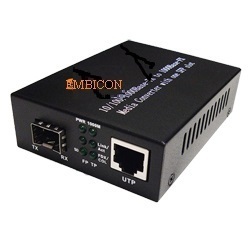 Embicon tech Hub are manufacturer ans supplier for Fiber sysetm, OFC, GEPON, GPON, Media Converter, Fiber Switch, Reverse POE Switch, Optical Transreceiver, Fiber attenators, Fiber patch coder and much more..
ETH-GOMC-1312-SFP 10/100/1000M SFP slot media converter are effective solution, while uplink interface upgrade or network re-design. It can implement data transmission between twisted pair electrical signals and optical signals (SFP module). 3.Provide one 10/100/1000Base-T port with RJ-45 connector, one SFP Slot socket.